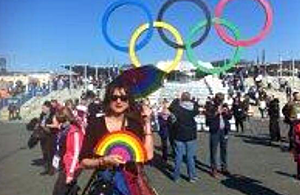 Vladimir Luxuria, the former Italian MP and the first transgender person to hold that office, has been arrested in Sochi after displaying a banner reading ‘Gay is OK’, according to Italian media reports. Luxuria was taken into custody, according to Italian LGBT activist Irma Battaglia of the ‘Gay Project’, and the attitude of the agents has been “brutal and aggressive”. Luxuria tweeted a photo earlier in the day as she held a rainbow fan. She wrote: “I’m in Sochi! Greetings with the colors of the rainbow, in the face of Putin! Vladimir Luxuria shows us the bravery and integrity that our athletes and representatives are too cowardly show. Make Sure To Order Your ‘American Horror Story’ Rubber Man Suit From Target For Halloween!